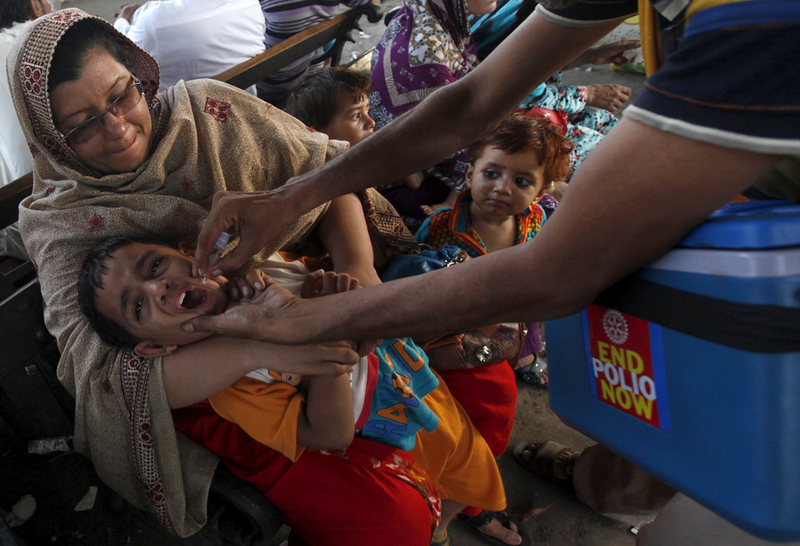 World Polio Day 2015: How far is Pakistan from going polio free? In August, Africa had gone an entire year without reporting a polio case; Nigeria reached this milestone in July. On March 27, 2014, India was certified polio-free. 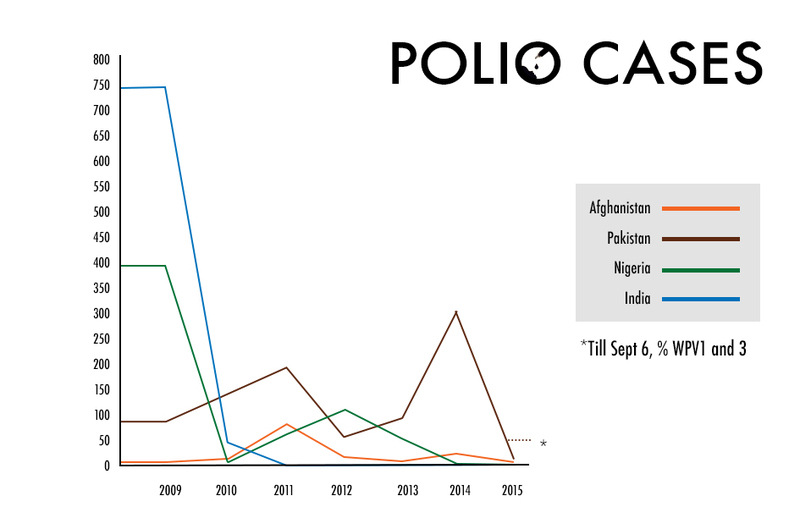 Only two countries have reported polio cases this year – Afghanistan and Pakistan. Much was said when Pakistan crossed the 300-case mark in 2014. With only 38 cases in 2015, the chatter has died down; 38 is closer to zero but still hundreds of thousands of children away. Officials say the country has at least 35 million children, though no census has conducted held since 1998. Many of these children are still to receive those vital drops of the polio vaccine. Many unborn ones need to be reached upon their birth. This World Polio Day, The Express Tribune has looked inwards, examining those last hurdles which Pakistan’s eradication efforts face, while turning to India to find valuable lessons in their 16-year-long battle to eliminate the crippling virus from a country where 170 million children were reached. Although consistent efforts have been made to curb the spread of polio, the virus continues to flourish in Khyber-Pakhtunkhwa and Fata. In recent times, experts have voiced concerns over Peshawar battling yet another front – this one against polio. The matter came to fore in October after samples of sewage water collected from Larama tested positive for the virus. At this critical juncture, local government representatives plan to step in, taking the fight to a more community or grass-roots level. 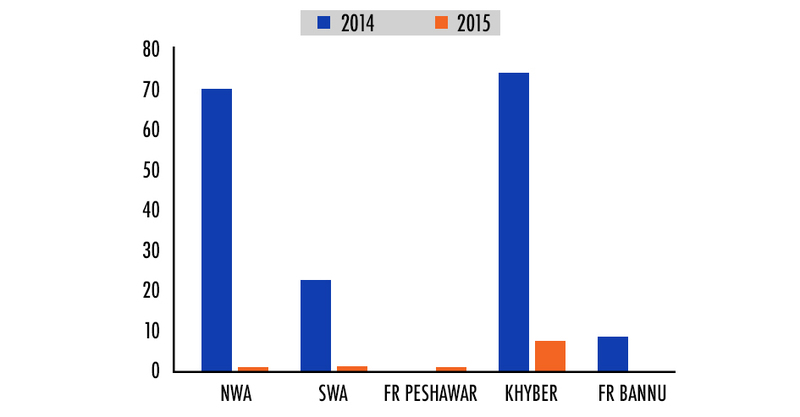 There is a long way to go before poliovirus is eliminated from Fata as there is lack of awareness about the virus. According to the teacher, such perceptions may have changed but have not been completely erased. Those involved in immunisation drives said more needs to be done to raise awareness in the region. Poliovirus has not yet been eradicated in Balochistan because the emergency plan was not implemented in letter and spirit said Emergency Operation Center Balochistan Coordinator Dr Syed Saifur Rehman. “The issue persists in only three districts of Balochistan: Quetta, Pishin and Qilla Abdullah, called the Quetta block,” said Rehman, showing the results of lot quality assurance sampling (LQAS). Rehman spent three days in Qilla Abdullah this week, one of the three districts where more than 95% cases were reported during the last two years. Even as polio cases dropped significantly in 2015, Karachi is still at high-risk for polio cases. Over the years, only three of 11 high-risk union councils could be declared safe. At least 11 union councils in the city were declared ‘high-risk’ two years ago in 2013, including Ittehad Town, Chishti Nagar, Islamia Colony, Gujro, Songal, Manghopir, Muzaffarabad, Muslimabad, Liaquatabad, Rahri and Chakra Goth. However, only Liaquatabad, Rahri and Chakra Goth have been declared safe in the last two years. In 1998, when the Global Polio Eradication Initiative was launched, 200,000 out of an estimated 350,000 cases were occurring in India. What followed over the next 13 years was one of the largest polio eradication efforts the world will ever see. India faced daunting challenges as wide-spread as nomadic groups, as clustered as the claustrophobic informal settlements in Mumbai and as new as 27 million babies born each year. But one of the most formidable foes was the door slammed in the face of a polio vaccinator. Many people voice doubts about the safety of the oral polio vaccine, more so after seven children fell ill following an immunisation in Bahawalpur. The Express Tribune spoke to officials and experts about the safety of the OPV. The PC-1 for Polio Eradication Initiative for 2016-18 worth $311 million is ready and is set to be tabled at Central Development Working Party (CDWP) meeting scheduled for the first week of November. After getting approved, PC-1 will be presented before the Executive Committee of the National Economic Council (ECNEC) for final endorsement. “Efforts have been made to incorporate new interventions in the new three-year plan to combat the disease and achieve the goal of interrupting the transmission of poliovirus by 2016,” National Emergency Operation Center for Polio Coordinator Dr Rana Muhammad Safdar said. come on guys…let’s not lose focus on whats most important for us…Shiv Sena and Kashmir.